Ever wondered if there was a quick, easy way to convert your own van? 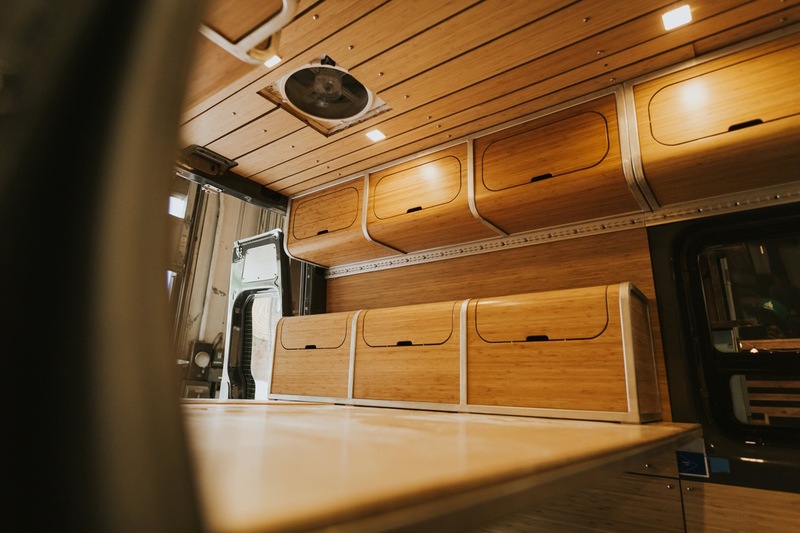 Well Portland-based company Zenvanz has released a sleek yet rugged modular camper van conversion kit which enables you to switch easily between camper and day van. 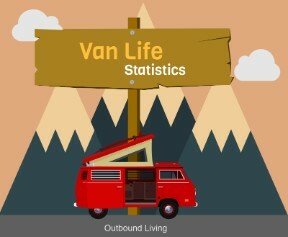 Bryan and Jen Danger are a couple from Portland who have been living the vanlife full time for 5 years, and whose own Mercedes Sprinter 4×4 van conversion gathered so much attention online they decided to start crafting and selling conversion kits. The kit’s cabinets are made from curved bamboo panels. Each kit contains everything you need to convert your own van, everything from kitchen cabinets to a bed and a fold out gear-drying rack. Everything is built from sleek eco-friendly bamboo panels, mounted on an aluminum exoskeleton and using stainless steel hardware. The cabinets mount easily to factory-installed holes with just a few bolts and minimal use of tools, and everything is modular meaning it can easily be stacked or removed to convert your van back into a day van. The finished appearance is a sleek, modern interior with a hint of rugged outdoor living. The kitchen/galley portion of the kit will contain a bamboo and Paperstone countertop, which is created from recycled paper and non-petroleum resin. 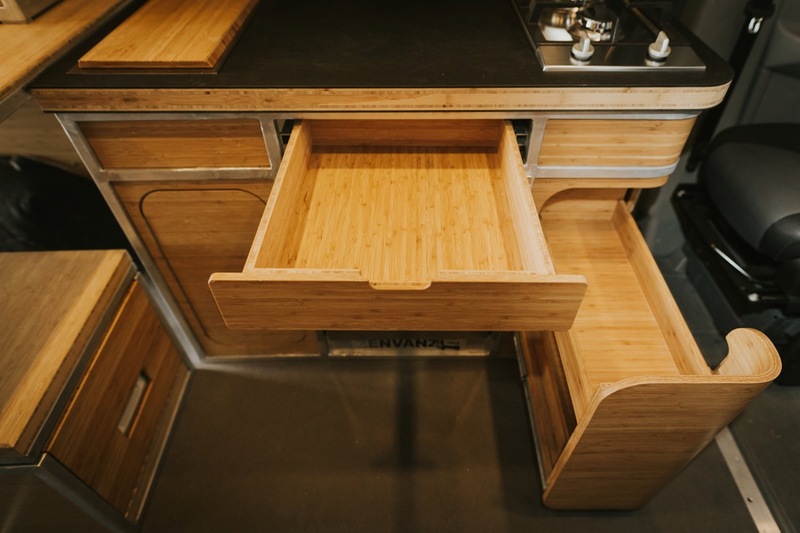 The kitchen unit will feature a soft close bamboo cutlery drawer and curved slide-out storage unit. 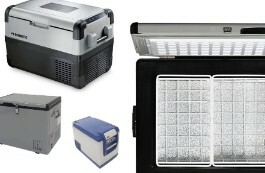 Your upgrade options include under-counter waterproof multicolour LED lighting, a fridge/freezer, a two ring propane hob, a sink with tap and a mounted tabletop. The kitchen features soft close drawers and a Paperstone countertop. Over in the bedroom area, you have an easily removable and stackable 3 panel bed system with the option of a 7” “extreme comfort” mattress, plus three bedside storage cabinets with stay-open hinges and an optional extra of interior cabinet LED lighting. 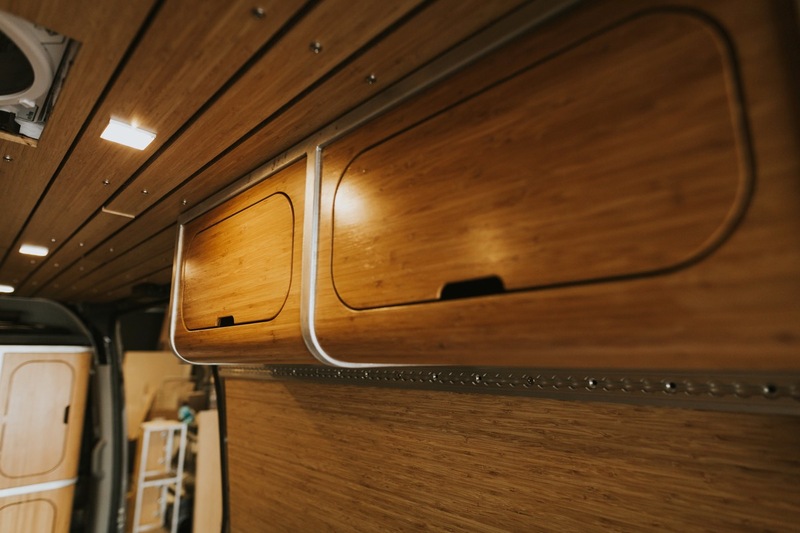 Above the bed you’ll find space for a total of seven hanging storage cabinets, five on the driver side and two on the passenger side, which are perfectly sized for storing clothes, blankets, toiletries or food. These sit neatly side by side to created a beautifully streamlined curve from front to back. The three panel bed system, surrounded by usable storage space. 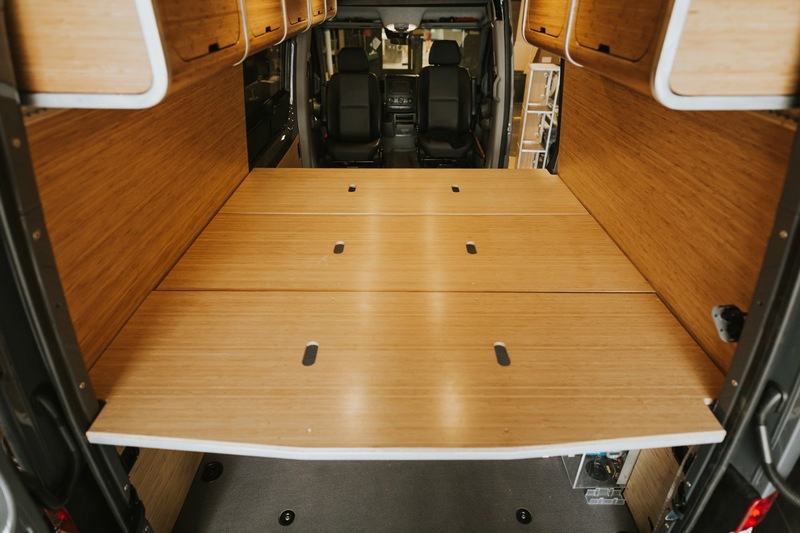 Also included in the kit is a fold out gear-drying rack which attaches to the upper door panel of the van’s sliding door, with five fold-out bamboo hooks to allow wet clothes to be hung and dried over the door step, then folded away when not in use. A nice added extra is the sleek bamboo slide-out drawer which conceals a Thetford Marine portable toilet, which is also available for an additional cost. The drawer slides open and locks shut for when the van is in transit. Additionally, you can also purchase sealed bamboo panels for all your doors and walls, and even 1/2” bamboo ceiling slats to really complete the look. 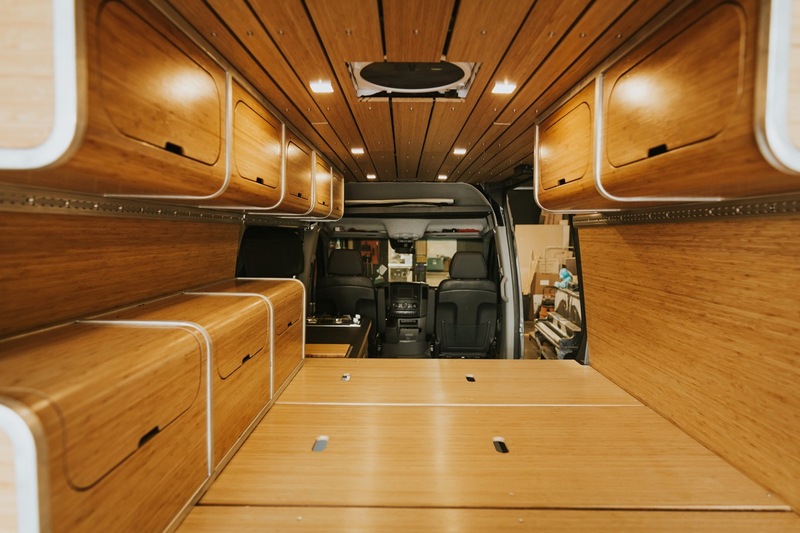 The full van conversion kit, with bamboo ceiling panels and sleek yet rugged storage. So what’s the price to pay for bamboo-cladded luxury and excellence? 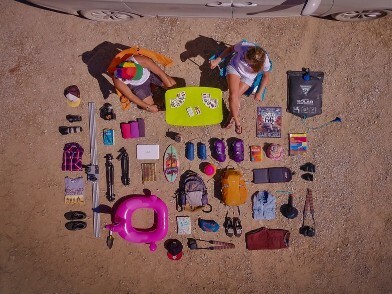 Well, the couple is currently retailing their starter kit on their website zenvans.com for a plush $18,000, and that’s not including any of the extras. 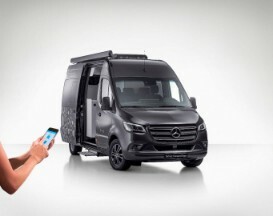 For an aspiring van dweller who wants flexibility and sleek design with minimal effort this conversion kit could be a perfect option, especially if you’re unsure whether you want to commit to van life full time just yet. 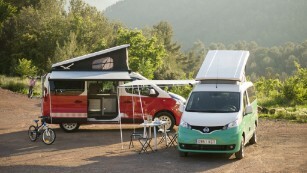 Campervan conversion kits seem to be right on trend right now, offering an enticing balance of ease, affordability, and style for even the most novice of builders.